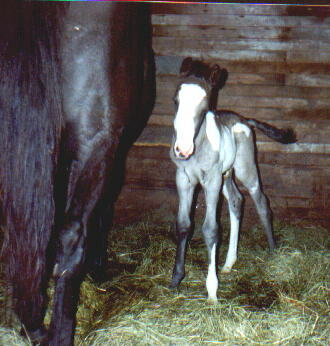 "Prize at 4 days old w/dam; Nela McCue"
Prize was born April 13, 1996, on Rumpkump Ranch in Bluffton, Minnesota. His sire; Shiloh McCue, is a loud, black overo with over 20 generations of black. His dam; Nela McCue is a black breeding stock. Both parents are by the late, great, Kingfisher McCue. 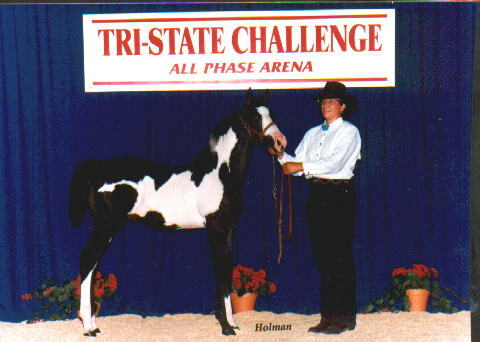 Prize is linebred Kingfisher McCue with 5x Kingfisher breeding and over 32 generations of black, with most being overo. "Prize at 3 1/2 months old. His third show took place in Spring Grove, Minnesota." In 1996, after 4 foal crops and not one single stud colt born on our ranch by our senior stallion; Shiloh McCue, we were ready to start looking for a second stallion. Everyone told me to start breeding in a different direction, time, and spot, if I wanted to get a stud colt. My farrier even said to show Shiloh McCue "little cards with stud colts on them," while he was breeding. 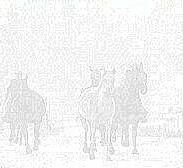 Finally, I broke down and said to Shiloh, "We need another stallion around here. I would like it to be your son, but if I don't get one by the end of this year, I am going to have to buy an outside stud for your daughters." I even went on to tell him exactly what the colt had to look like and which mare he had to be out of. I told a few of my friends what I wanted, " A black overo stud colt with not as much white as Shiloh and out of his half sister; Nela McCue. The colt needed to have dark eyes without the bald face(mind you, I do like these, but in our area it isn't well liked), with Shiloh's short back and Nela's long neck. I also wanted the stud colt to have Shiloh's trademark on both sides and his dispositon. My friend's told me, "You aren't asking for much, are you? or You'll never get it!" My daughter said, "Be careful what you wish for, MOM." So, when the time came for the colts to start dropping. Wouldn't you believe it!!! Stud colts everywhere!!! I sure couldn't believe it!!! My daughter reminded me of what I wished for. Nela was due on my birthday(Saturday, April 12th) that year. So, while most of you were out all night partying, I was in the barn. I finally decided to go to the house at 1:00 a.m the next morning to get some sleep. I woke up around quarter to 6, grabbed a piece of left over birthday cake, headed for the barn thinking that my prize baby was already born without me being there and wouldn't you know... as I stepped into the barn, his one front foot was making an entrance into the world. I was there to help. I couldn't help myself, I just had to roll him over and see if that trademark was on both sides----AND IT WAS!!! The only thing that he didn't get that I had wanted for him, was the name, " Decka Three Kings." But, one look at him and I knew he needed something special, something perfect. It was our first year showing, prize made it special! He walked away with lots of state points, prize money, and a couple of awards. He's retired from the show ring, as well as the breeding shed now. He had been a definite asset to our breeding program and complimented his sire completely. He was a 99% color producer during his reign over mares and we'd been offered $9000.00 for him as a young 2 year old, but refused it(even before seeing his offspring). So, if you were to ask, "What is this guy worth?" I'd have to say, "GOLD!!!" But I'd settle for $25,000.00, and that's only because we plan on keeping him `til he departs. At one time we had both parents, an auntie and a grandmother. That's how much we love this horse and his bloodline!